This year a small-cap and mid-cap stocks have given magnificent return compared to heavy weights and large-cap shares. Small Cap and Mid Cap stocks have become favorite stocks of the retail investor, FII, and Mutual funds. However, It is difficult to identify good small cap and mid cap stocks for investment. If you are looking for Small-cap and mid-cap stocks with good upside potential here is a list of Small Cap and Mid Cap Stocks for Investment 2018. Prior to discussing potential small-cap and mid-cap stocks let’s take a look at Mutlibagger Small-cap and mid-cap stocks of 2017. Multibagger Small Cap Mid Cap stocks for 2017 were India Bull Ventures, Sanwaria Consumer Ltd, Manaksia Steels, SIL Investments, Philips Carbon Black, Sakuma Exports, Visaka Industries, India Glycols Limited, Panama Petrochem, Dhampur Sugar Mills, Ramky Infrastructure, Andhra Sugars, GNFC, Kolte Patil Developers etc. 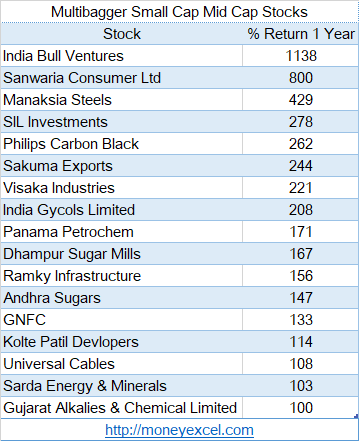 A complete list of multibagger stocks along with return is given below. Minda Corporation is first stock on the list of potential multibagger. Minda Corporation is one of the largest suppliers of an electronic & mechanical security system for automobile segment. The company is on growth trajectory via acquisitions and JVs. Company’s debt to equity ratio is improved. Company’s return on equity is good. Minda Corporation has reported strong order book under all major business verticals. Management of the company is focusing more on R&D which gives a competitive edge to the company. Overall it is a good stock for investment. Rallis India is next stock in the list of multibagger. Rallis India is a subsidiary of Tata Chemical Group. EPS of this stock is increasing. Return on Equity is good. A company is launching new products every year. Rallis is partnering with leading companies in the business segment of crop protection chemical, polymers, and Intermediates. A company has a very good distribution network. The company is virtually debt free. Overall one can invest in the Rallis India for the long term. BASF is also a chemical based company. This company produces a chemical for the automotive industry that provides protection against corrosion and overheating. Some chemical also reduces vibration and noise level. The company also produces a coating for cars. Going forward auto industry is expected to perform very well. This will result in the growth of the company. In addition to that Agrochemical and crop protection business of BASF India is doing well. You can invest in BASF India. Textile based company Pearl Global Industries is another potential multibagger stock. The company has a good presence in the domestic and international market such as USA, Indonesia, and Bangladesh. The company’s major revenue is from export business. They have largest in-house embroidery facility in India. The company is also expanding capacity by adding new textile manufacturing facility. Overall I find this stock good for investment. The last potential multibagger stock for 2018 is Ruchira Papers. Ruchira Paper has already given a very good return for the investor however still stock contains good potential. Return on equity ratio of this stock is good. The company has good consistent profit growth 33.43% over 5 years. The company has been maintaining a healthy dividend payout of 17.60%. What is your take on these stocks? Do you think these multi-bagger stocks will able to give good returns in the future? 1.Do you have paid service? 2.Can you provide the list of multibagger stocks for 2018? I am not giving any paid services. I have already shared list of potential multibagger stocks of 2018.